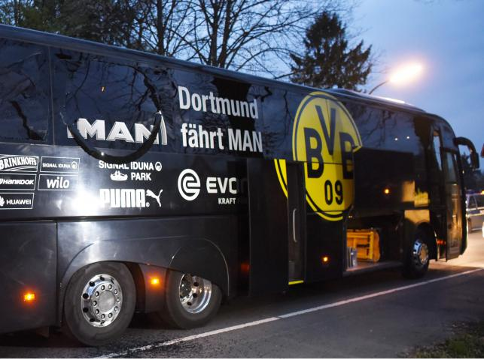 Police commandos Friday arrested a German-Russian man suspected of carrying out a bomb attack on Borussia Dortmund’s team bus, prosecutors said, charging that the motive was financial and not terror-related. They said the man, identified only as 28-year-old Sergej W., was hoping to profit from a drop in the football team’s share price as a result of last week’s attack. Three explosive devices hidden in a hedge went off next to the team bus on April 11, just as it left the squad’s hotel heading for a Champions League quarter-final match at home against Monaco. The blasts shattered bus windows and Spanish international Marc Bartra, 26, broke his wrist, while a motorcycle police officer suffered inner ear damage from the blast. “The accused is suspected of having carried out the attack on the team bus,” prosecutors said after the elite GSG 9 police unit arrested the suspect at dawn in Tuebingen, near the southwestern city of Stuttgart. The suspect was staying in the same Dortmund hotel as the team, the Hotel L’Arrivee, with a view of the scene where the bombs went off, and had bought so-called put options on the team’s shares on the day of the incident, prosecutors said. These 15,000 options could have been sold at a pre-determined price by June 17, with a sharp fall in the share price promising a high profit. “A significant drop in the price could have been expected if, as a result of the attack, players had been seriously injured or even killed,” prosecutors said. Interior Minister Thomas de Maiziere said that, if it was confirmed the suspect planned to murder footballers to manipulate the stock market, then “this would be a particularly repugnant motive”. The fact that fake claims of responsibility, purportedly from Islamic radicals, were left at the scene, he said, pointed at “an especially perfidious way of playing on popular fears”. Sergej. W had allegedly taken out a loan of tens of thousands of euros to pay for the put options, most of which he purchased online from the IP address of the hotel, prosecutors said. Prosecution spokeswoman Frauke Koehler said police financial experts were still calculating how much he could have hoped to gain, while Bild newspaper put the potential gains in the millions. “The suspect’s profit would have grown the more the share of Borussia Dortmund fell,” she said. Koehler said there was “no indication so far” of accomplices, but said investigators did not rule out that others were involved. The three explosive devices, packed with cigarette-length metal rods, were hidden along a 12-metre (40-foot) stretch of the hedge. They were remotely triggered, and shrapnel was found as far as 250 metres away, while one metal piece was lodged in the headrest of a coach seat. Spiegel Online reported the suspect was a former soldier who went through Bundeswehr (German armed forces) basic training in 2008. Bild reported police believed the suspect was capable of building a remotely-triggered bomb, having won an educational award in electronics and engineering in 2005. The man had drawn attention at the hotel, reported Bild—first by insisting on a top-level room at the front side and then, in the pandemonium after the blasts, by calmly walking to its restaurant to order a steak. Three purported claims of responsibility stating a radical Islamist motive were found at the scene, on paper bearing no fingerprints, prosecutors said, adding that Islamic studies experts had voiced “considerable doubts” about their authenticity. An Iraqi man was taken into custody over a suspected Islamist link but was later cleared of involvement in the bus attack. Similarly, a purported claim stating a far-right motive sent to German media bore “contradictions and inconsistencies”, prosecutors said, adding there was “no indication that it was sent by the perpetrator”. Borussia Dortmund thanked police, who had reportedly been watching the suspect for days, following leads including a tipoff from a financial sector source. “We are very grateful and hope that with the suspect’s arrest, the perpetrator responsible for the despicable attack against our players and staff members has been caught,” the club said in a statement. The fact that, aside from Bartra, “no others were wounded or even killed, was—as we know today—solely due to huge luck”, said the statement from the club, which plans to step up security by employing GSG 9 and other elite police veterans. Trainer Thomas Tuchel said that “if the motive is cleared up then this will help us a lot to come to terms” with the traumatic attack.